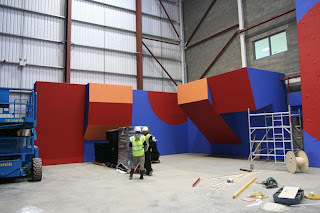 Last week I was in the north east of Scotland to get a sneak preview of Aberdeen's new climbing wall - Transition Extreme, due to open next month. I got a tour from local climbing guru Tim Rankin, who seems to be responsible for putting up virtually all of the hard routes in this part of the country and is now part of the team running the wall. Aberdeen is long overdue a decent training facility. In recent years a few projects have failed to get of the ground, so it's good that at last it has happened. The facilities look pretty good too, 16m? 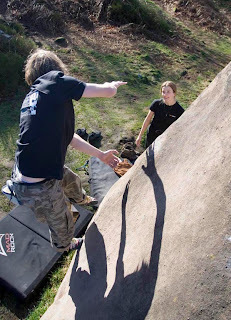 high and a good size bouldering area. 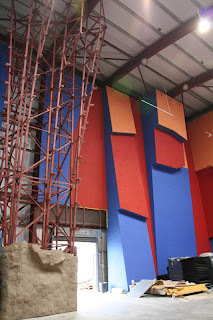 But the most important ingredient to any climbing wall is the route setting. 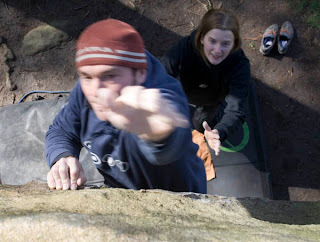 Down in the central belt I keep hearing from people how fed up they are with the routes at some of the walls (hence the mass migration to Ratho when it re-opened). At least Aberdeen seem to be getting it right with a list of 'big name' routes setters from around the UK heading up shortly to do their stuff. 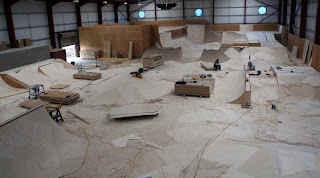 Ok, I thought the climbing wall was good, but in the adjacent part of the building they have got a scate park under construction that is mind blowing. A football pitch size worth of ... well I don't know what all this stuff is called... but it's pretty amazing. Kids nowerdays huh. Never had this sort of thing when I was a lad. 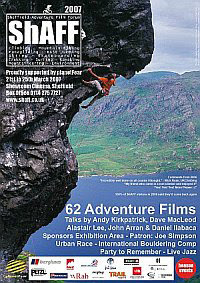 Back from the Peak and we then headed straight over to Dumbarton to catch up with Dave MacLeod. 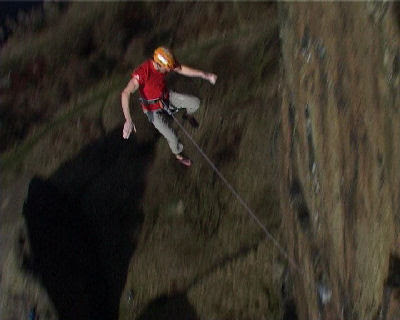 Dave at the moment seems to be stretching the concept of All Round Climber to the absolute limit. Just back from the BMC internation winter meet where he put up a new VIII 8 on Ben Nevis, he was now psyched for a hard bouldering first ascent at Dumbarton before then jetting off in a couple of days to Siurana, Spain with his harness and quickdraws in hand. 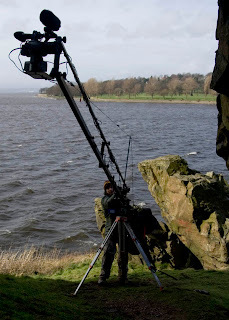 This morning at Dumbarton a stong wind was scudding in off the Clyde and gusts to 60 mph were causing us significant problems with the film equipment. Dave himself was also was also really struggling to stay warm enough to attempt his main project. That project (the full start addition to his recent font 8b) was quickly abandoned and we headed to the relative shelter of the Mugsy cave for Plan B.
Dumbarton continues to be as popular as ever. 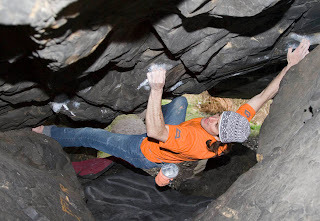 The hard routes are currently receiving a lot of attention and indeed success, Malcolm Smith recently repeating Pressure font 8b confirming the grade and Alan Cassidy repeating King Kong font 8a. 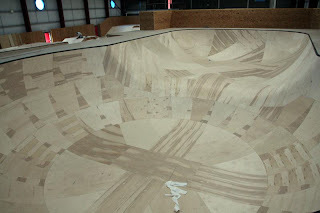 Even on a dreach Monday afternoon we were joined by a group of psyched locals including the ever present John Watson, huddled under in the Mugsy Cave and scoping out yet more possibilities. From deep under the cave Dave managed to take a sitting start through a powerfull crux sequence to finally break out through the lip and onto Mugsy (font 7b) to top out. 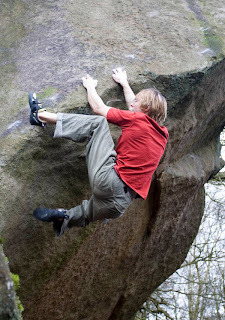 A new Font 8a, Hokku. 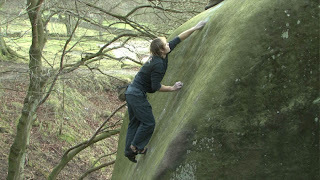 It was also quite an interesting boulder problem to film. A number of openings in the cave wall provide vantage points for the several cameras that we had following the sequence. Quite esoteric. 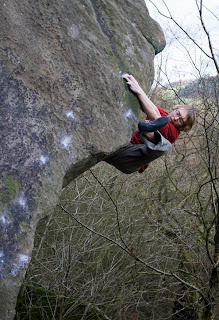 The Hot Aches crew headed back south on Thursday for some filming and even a bit of climbing. 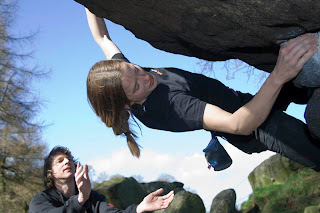 Friday dawned bright and we headed to Cratcliffe to get some bouldering in before pointing the cameras towards one of gritstone's 'last great problems'. 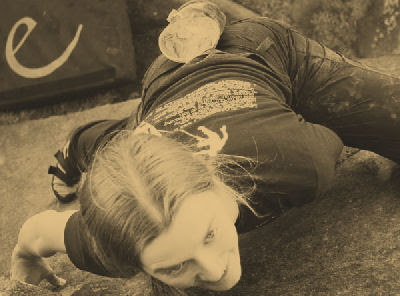 Sarah Daniels modeling the new Hot Aches T shirt (more about this soon), sending Razor Edge B7. Diff is so impressed that he's already started the round of applause. Onto the unclimbed line, but by now the sun was warm and conditions were just not good enough. 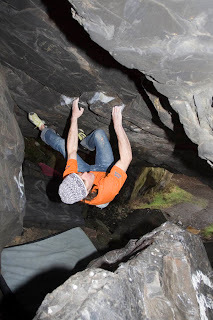 So we headed a bit further around the crag and caught up with Ben Bransby who ignored the heat and re-climbed his superb and scary looking new highball problem, the Prow. 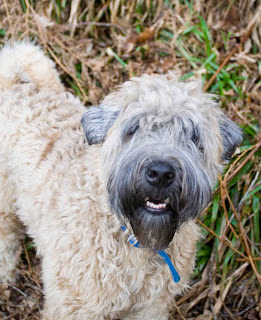 Meanwhile Ben's dog Klem threatened proceedings by stealing the Hot Aches food supplies. 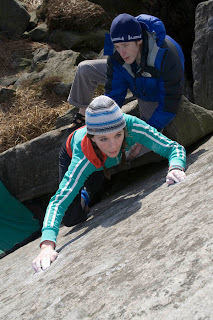 Emily Brazenell climbing Beauty font 6c at Stanage the next day. Spotted by James Pearson. 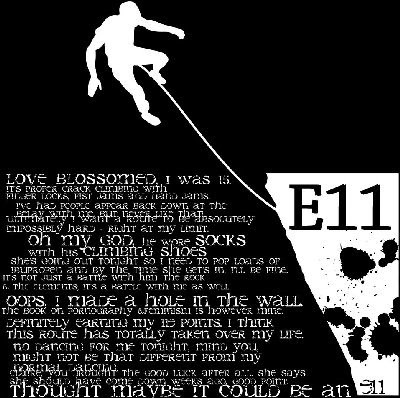 At Black Rocks James Pearson and Adam Long were attempting a ground up ascent of Johnny Dawes impressive E8 slab from 1994, The Angel’s Share E8 7a. The first ascent was done solo after top rope practice. 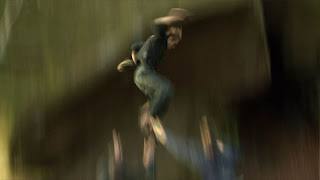 It was described as a 'desperate route with unusual moves: no handholds on the pebble-less slab result in several rock-overs which require timed momentum from the previous rock-over to enable a foot to be placed higher'. The team had 4 mats which makes it a different proposition but still the prospect of a big fall to a small landing area. Late in the afternoon he succeeded, but not content immediately despatched the E6 to the right and then rounded it off by quickly sending the E7 to the left. 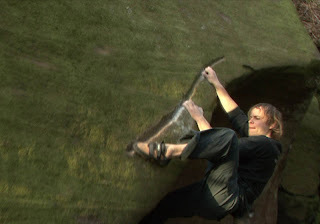 Impressive slab climbing. A North American version (NTSC) of our E11 DVD is now available from our distributor Vista Cerro Productions. To celebrate the launch of the DVD in North America we’ve produced a special comedy version of the trailer staring Timmy O’Neill.